2018 Holiday Hiring Outlook | Challenger, Gray & Christmas, Inc. The holiday hiring season is off to a strong start, as major announcements from Macy’s and FedEx can attest. Retailers and logistics companies are gearing up for a huge shopping season in light of a solid economy and high consumer confidence. This will translate into more jobs added for seasonal hiring, according to a forecast released Thursday from global outplacement and executive coaching firm Challenger, Gray & Christmas, Inc. Yesterday, Macy’s announced it will hire 80,000 seasonal workers, the same number as last year. Macy’s eventually hired another 7,000 seasonal workers in December. FedEx likewise announced it is looking for 55,000 workers, 5,000 more than last year. “Retailers have been aggressively hiring seasonal workers since July to combat the tight job market. 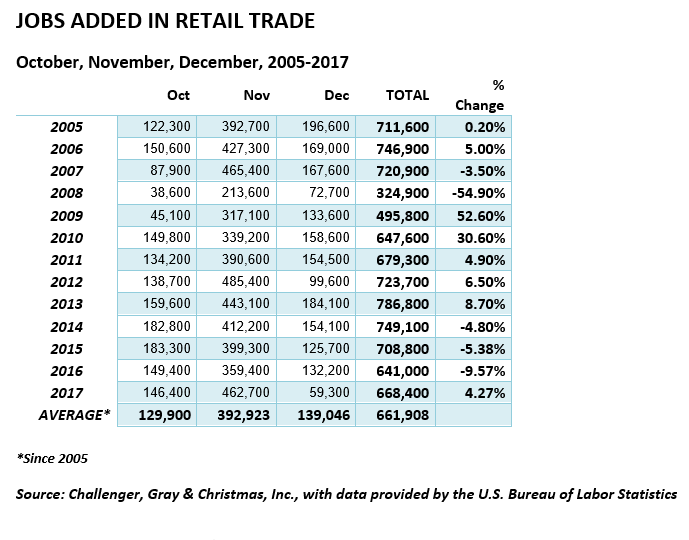 This holiday season will be a good time for workers who have had trouble finding employment or those who are discouraged or marginally attached to the labor force, as retail, transport, and warehousing jobs will be plentiful,” said Andrew Challenger, Vice President of Challenger, Gray & Christmas, Inc.
Last year, seasonal retail employment increased by 668,400 during the final three months of the year, 4.3 percent higher than the 641,000 jobs added in 2016, according to employment data from the Bureau of Labor Statistics (BLS). “Seasonal jobs are no longer in retail alone. With the rise of online shopping, transport and warehousing companies are also looking for seasonal workers. We’ve seen this trend over the last few years,” said Challenger. Last year, BLS data showed that transportation and warehousing employment increased by a non-seasonally adjusted 279,700, up 13.4 percent from the 246,700 workers in the final quarter of 2016 and 6.6 percent higher than the 262,300 workers hired in this sector in the final three months of 2015. “Retailers will have to offer competitive compensation or other perks to attract the workers needed for this holiday season. Already, we have seen some retailers offering discounted merchandise or special shopping days for their employees,” said Challenger. In fact, Kohl’s announced it was offering 15 percent discounts and “associate shopping days” for the seasonal workers they hired this summer. Meanwhile, JCPenney, which announced they were hiring 18,000 seasonal, back-to-school, workers in July, is hiring for a salon program, offering stylists a competitive compensation plan, paid training, and paid time off, with some participants eligible to receive 401(k) benefits. On Friday, JCPenney announced they are hiring over 39,000 workers for their stores, supply chain, and customer care for the holiday season. In addition to Macy’s and FedEx’s announcements, Michaels has announced plans to hire 15,000 holiday workers, and 1-800-Flowers will staff an additional 8,000 workers for the holidays, both on track with their hiring plans last year. “While it is possible that we’ll see fewer of these large-scale announcements due to the closures of many brick-and-mortar stores, it’s likely those jobs will still be needed for fulfillment centers and warehousing,” said Challenger.